Merchandiser Exchange is your source for new and used vending equipment, replacement parts, and vending equipment repair services. With 25 years of combined experience in the vending industry, we understand the needs of any sized operator. 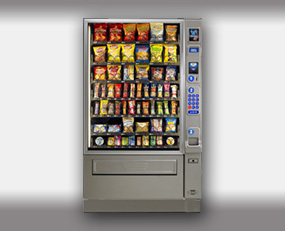 For those who are just beginning their transition into the vending industry, Merchandiser exchange offers consulting services on equipment selection, remote monitoring integration, and client contractual agreements. We are the premier authorized distributor of the biggest names in vending equipment, including AMS, Crane, JE Adams and USI. We have a large variety of equipment on display in our showroom. Merchandiser Exchange offers equipment delivery service to anywhere in the continental United States. Our staff of highly skilled technicians allows Merchandiser Exchange to offer timely repair services on all professional grade vending equipment. We stock a large inventory of parts for the majority of high demand vendors. In addition to providing used and new equipment, Merchandiser Exchange has an equipment purchasing program that allows operators to sell us their old, used, or new equipment for cash or credit towards the purchase of a new machine. Please use the Equipment Surplus form for a current quote on your equipment. Learn more about what Merchandiser Exchange can do for you. Call us today at 267-799-5743 or e-mail info@merchandiserexchange.com.